The installation file of this heavy loaded ChessBase Magazine is over 3,47GM and the game file included the world championship games is over 6000 entries! 1.e4 c5 2.Nf3 e6 3.c4 Nc6 4.d4 cxd4 5.Nxd4 Bc5 Enough with the Berlin and the Petroff, now that Caruana needs to win, it's an Open Sicilian! Interestingly, Magnus opts for as similar a formation as possible to the one he used to clinch the 2016 tiebreak... 6.Nc2 Nf6 [6...Qb6!? is probably the most obvious test of White's slow setup. Notwithstanding which, it was only played in one game, between 1900-level players, so we may as well just analyse without reference to praxis. 7.Qd2!? (7.Qe2 d6 8.Nc3 Bd7 9.Rb1 Nf6 10.Be3 Bxe3 11.Nxe3 seems easy enough, but it's also possible to imagine White getting outplayed on the dark squares.) 7...Nf6 8.Nc3 Ng4 9.f3 Nf2 10.Na4 Qc7 11.Nxc5 Nxh1 12.f4÷ With a horrifically messy position where the prepared player wins: White intends Be2, Kf1-g1, but Black can play ...d5 and open the centre.] 7.Nc3 0-0 8.Be3 b6 9.Be2 Bb7 10.0-0 Qe7 11.Qd2 Rfd8 12.Rfd1?! This may be a little inaccurate and Black seems to have ways to make his equality clearer. [12.a3 a5 13.Rad1 seems preferable, securing the right to transfer a knight via b5 at will.] 12...Ne5 In this way Black is forcing through ...d5, though for some reason he ultimately decided not to play it. 13.Bxc5 [13.Bd4 d6 and the tension doesn't help White, as (e.g.) ...Rac8 and ...h6 can be played before Black needs to do any further thinking, while White's pushes b4 and f4 require some serious thought.] 13...bxc5 14.f4 Ng6 15.Qe3 d6 [15...d5 seemed clever to me, but it's worth pointing out that the simplifications would not have been useful in the match situation. 16.exd5 exd5 17.Qxe7 Nxe7 18.cxd5 Nexd5 19.Nxd5 Rxd5 20.Ne3= It is hard to imagine Magnus losing this as White, but maybe...?] 16.Rd2 a6 17.Rad1 Qc7 18.b3 h6 19.g3 Rd7 20.Bf3 Re8 White has a small something around here, even if engines disagree, because Black simply has no way to execute either ...e5 or ...d5. 21.Qf2 The first of a few moves that tempted Black to play ...d5 and accept drawishness; while these weren't the most exact for White they may have been the least risky. 21...Ne7 22.h3 Red8 23.Bg2 Nc6 [23...d5 again seems to give safe equality, but that's not good enough. 24.cxd5 exd5 25.e5 Ne4 26.Nxe4 dxe4 27.Ne3=] 24.g4 Qa5 25.Na4 Qc7 An ill omen: Black doesn't know what to do. 26.e5?! Seeking simplification and possibly a bishop-vs-knight situation, but maybe this is too quick. [26.Nc3² was perfectly possible, challenging Black to do better!] 26...dxe5 27.Nxc5 Rxd2 28.Rxd2 Rxd2 29.Qxd2 Ba8 This is not a bad move, but White is able to pretty much kill the game now, whereas after the alternative Black could have played for 3 results. [I'm not sure if Black thought he was worse after 29...exf4 30.Nxb7 Qxb7 31.Qxf4÷ but I don't think he is, and neither does the engine; the practical chances look quite alright.] 30.fxe5 Qxe5 31.Nd7 Qb2 32.Qd6 Nxd7 33.Qxd7 Qxc2 Around here, there are of course tons of ways for Black to deliver perpetual check, but it is extremely difficult to think of how he could do more. 34.Qe8+ Kh7 35.Qxa8 Qd1+ 36.Kh2 Qd6+ 37.Kh1 Nd4 38.Qe4+ f5 39.gxf5 exf5 40.Qe3 Ne6 41.b4 Ng5?! Now Black is more likely to lose, but of course he may not have minded this. [41...g5 tries to keep something in the position, but after 42.c5 Qd1+ 43.Kh2 it transpires that Black can't generate anything without allowing White to deliver perpetual: 43...Nf4 44.Qe7+ Kg6=] 42.c5 Qf6 43.c6± Ne6? This is where the 3rd game, and hence the match, were lost. [43...Qd6 44.Qc1 Ne6 45.Qc4 is passive for Black, but there are a few more tricks than in the game.] 44.a4 Nc7 45.Qf4 Ne6 46.Qd6 You could see Magnus wondering whether to give one last tease and play Qe3, either for the draw or for the trolling effect. In the end he chose this way, which is very simply winning. 46...Qa1+ 47.Kh2 Nd4 48.c7 Qc3 49.Qc5 Qe3 50.c8Q f4 51.Qg4 And it was all over. 1-0. Included are latest theory surveys as The London System Revisited 1.d4 d5 2.Bf4 Nf6 4.e3 c5 by Daniel Naroditsky, English without fianchetto 1.c4 e5 2.Nc3 Nf6 3.Nf3 Nc6 4.e3 Bb4 5.Qc2,Symmetrical English 1.Nf3 c5 2.c4 Nc6 4.Nc3 e5 4.e3 Nf6 5.d4 by Evgeny Postny,Pirc/Freestyle 1.e4 Nc6 2.Nf3 d6 3.d4 Nf6 4.Nc3 g6 by Lars Schandorff,Caro-Kann Advance Variation 1.e4 c6 2.d4 d5 3.e5 c5 4.dxc5 e6 by Robert Ris, Sicilian Dragon 1.e4 c5 2.Nf3 d6 3.d4 cxd4 4.Nxd4 Nf6 5.Nc3 g6 6.Be3 Bg7 7.Be2 0-0 8.Dd2 Nc6 9.0-0-0!? By Krisztian Szabo,Najdorf delayed Poisoned Pawn Variation 1.e4 c5 2.Nf3 d6 3.Nc3 Nf6 4.d4 cxd4 5.Nxd4 a6 6.Bg5 e6 7.f4 h6 8.Bh4 Qb6 by Renato Quintiliano,Petroff 1.e4 e5 2.Nf3 Nf6 3.Nxe5 d6 4.Nf3 Nxe4 5.d4 d5 6.Bd3 Bd6 by Petra Papp,The Two Knights Defence 1.e4 e5 2.Nf3 Nc6 3.Bc4 Nf6 4.d3 h6 by Alexey Kuzmin,Queens Gambit Accepted 1.d4 d5 2.c4 dxc4 3.e4 Nc6 4.Be3 by Robert Hungarski and at last the Queens Indian 1.d4 Nf6 2.Nf3 e6 3.e3 b6 4.Bd3 Bb7 5.0-0 d5 6.b3 Bd6 7.Bb2 0-0 8.c4 Nbd7 9.Nc3 a6 10.Rc1 by Mihail Marin. 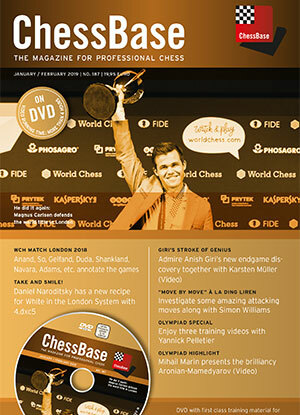 Other interesting contributions are Opening Videos,exciting DVD columns as Williams:Move by Move,Olympiad Special,Rogozenco:The Classic,Marin:Strategy,Reeh:Tactics,Knaak:Topical opening traps and the great Karsten Müller:Endgames from the chess Olympiad. Included is a eye catching booklet in two languages!